MWC: Nokia to unveil Android-powered smartphone | What Hi-Fi? An Android-powered Nokia smartphone is expected to be unveiled at MWC 2014, even though Microsoft acquired the Finnish manufacturer in 2013. An Android-powered Nokia smartphone has been subject to much speculation over the recent months, but now The Wall Street Journal understands that it will be unveiled at the Mobile World Congress in Barcelona this month. It seems like an unlikely move for Nokia, given that it was acquired by Microsoft last year. But plans for such a handset were rumoured to already be in place before that deal was completed. 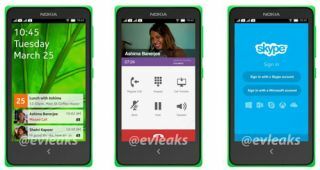 The handset, currently codenamed 'Normandy', is expected to come running a heavily customised Nokia skin – in a similar fashion to the Amazon Kindle Fire HDX 7. Users won't be able to access the familiar Google Play Store; instead they will be treated to Nokia's own store with authorised apps. Nokia Here Maps replaces Google's service and Nokia's music streaming service MixRadio will come preinstalled. Reliable leakster @evleaks revelead the expected specifications of the phone on his Twitter feed. He says it will feature a 4in WVGA screen; 512MB of RAM; 4GB of onboard storage; 5MP camera; 1500mAh battery; be dual-sim enabled. It is also expected to come in six different colours. As mentioned, the phone is expected to receive its debut at MWC, so we'll report live as and when we hear anything new.